This simple Seared Salmon over Whole Wheat Pasta with Kale, Garlic, and Pine Nuts dinner is ridiculously healthy, family-friendly, and easy enough for a weeknight dinner. A simple, healthy weeknight dinner was on order this evening, and this lovely dish was the result. I love putting salmon over pasta or rice because the natural oil from the fish acts to deliciously dress the dish. The toasted pine nuts were a last second add not in the picture above. Guess I’ll just have to remake this to get the photo just right…with how good this was, I will happily do so very soon! Meanwhile, heat a large skillet on high heat. 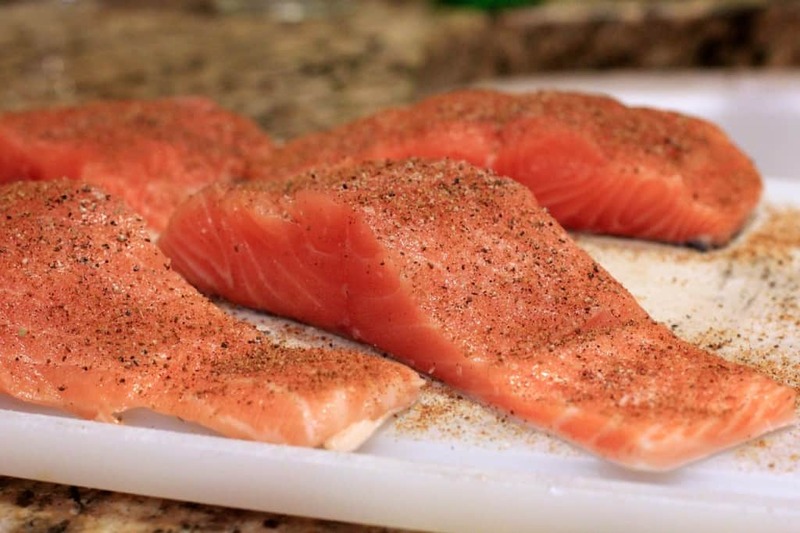 Season the flesh side of the salmon with salt, pepper, and Old Bay. Add 1 tablespoon oil to the hot skillet, heat briefly, then add the fish skin side up. Season the skin with salt, pepper, and Old Bay. When the fish gives from the pan with a gentle nudge, flip so it is skin side down, and put the entire pan in the oven while the pasta cooks. Put the pine nuts on a small bake sheet and toast in the oven ~5 minutes. Remove and set aside. Salt the water for the pasta with a handful salt. Add the pasta and set timer for 1 minute under al dente. Drain. While the pasta is cooking, put a large nonstick to heat on high. Add the kale and the remaining 1 tablespoon olive oil, season with salt, and saute the kale 2 minutes. Add the garlic and cook another minute. Add the wine and cook until liquid is almost gone. Add the drained pasta and 1/4 c reserved pasta water. Toss and cook to finish the pasta, adding more pasta water if necessary. Toss in the parmesan and a couple more good pinches salt. To serve, place a mound of pasta on each of 4 plates. Top each with a piece of salmon, more grated parmesan, and toasted pine nuts. The pasta alone looks amazing and then you topped it will such a pretty piece of fish. Yum! i’m with you when it comes to letting the fish dress the pasta. i tend to go with a butter and mushroom sauce, but i might just have to try your kale pasta. it looks infinitely lighter, which seems like it might be right up my alley. i was wondering, do you always finish your fish in the oven? i tend to like mine pretty rare, so i’m curious how done it ends up in the end. I will have to agree. 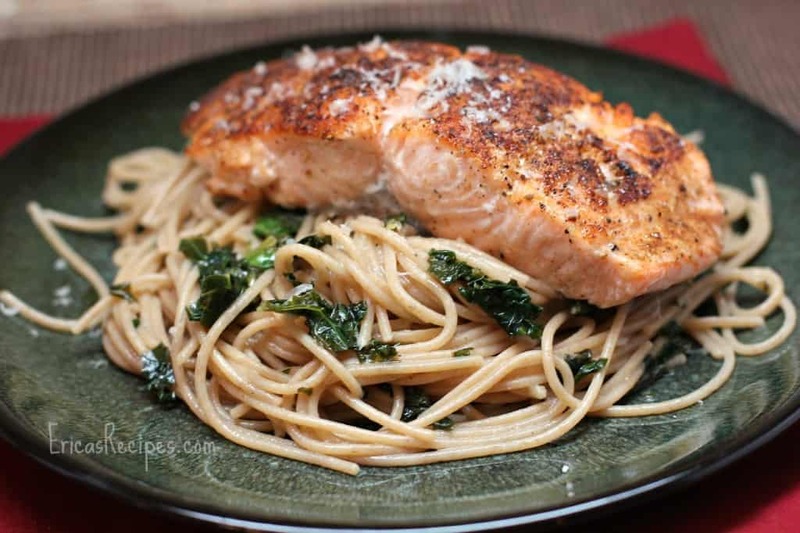 Salmon over pasta is a wonderful combination and presentation! Add some good ole’ Old Bay seasoning! yes! I bet that was incredibly good! I think there should be a cooking challenge using Old bay seasoning 🙂 Thanks for the recipe Erica, looks awesome! 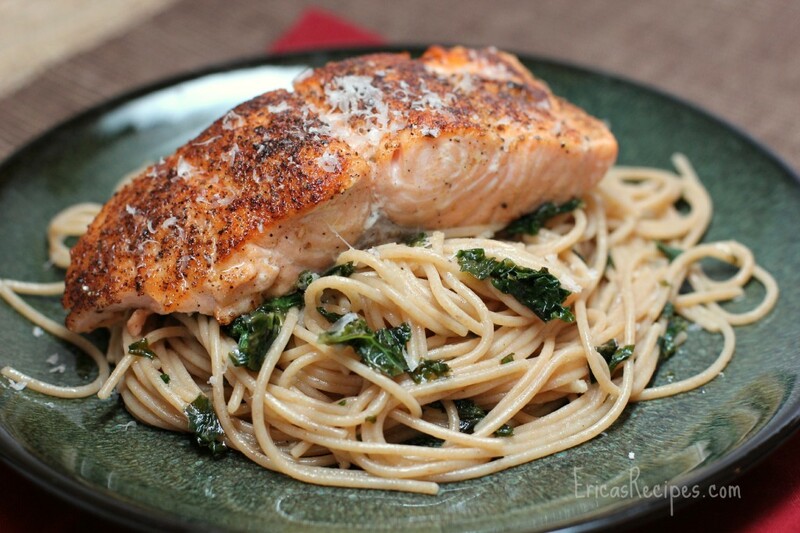 I really like the way you cooked the salmon (and the pasta). We eat it most weeks and I need to find some more interesting ways to do it. I made a version of this last night. I didn’t have the Old Bay so I used a BBQ rub instead. Otherwise did everything else sans the pine nuts. It was really good. My kids loved the pasta w/kale and my husband asked me to make it again. Thanks!